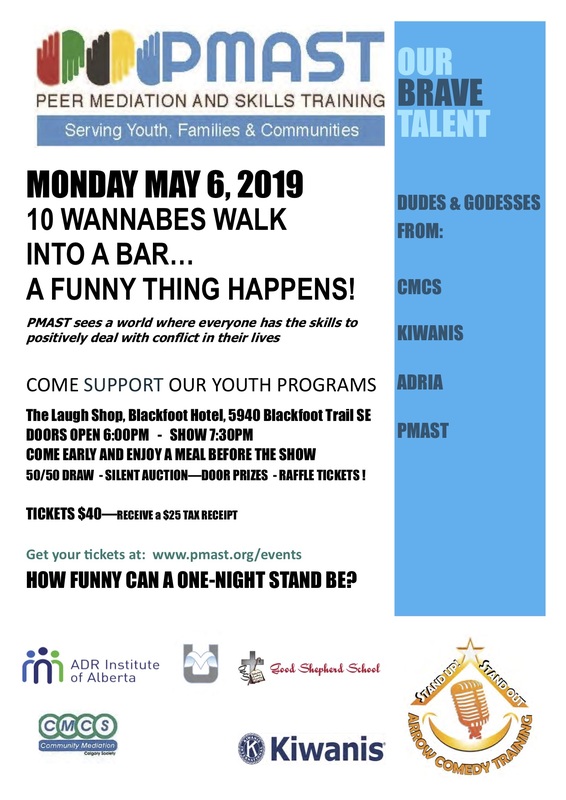 Set up: 10 Wannabes Walk into a bar….a funny thing happens! We have 10 brave souls will be going through a boot camp also known as a “Three day thrill” through Derek Wilken to learn how to do Stand Up and they will perform their five minute routine for us Monday evening, May 6, 2019! These 10 people saw the vision of PMAST, whose focus is on building strong youth and strong communities. PMAST sees a world where everyone as the skills to positively deal with conflict in their lives. We are so excited to see our supporters and communities taking part in this year’s event – to support us in this FUNdraising effort which will be channelled through Birdies for Kids who will top up our efforts by 50%. A worth while endeavour indeed. Our children are worth it. HOW FUNNY CAN A ONE NIGHT STAND BE?? You are invited to witness the hilarious results on Monday, May 6, 2019. Tickets available on our site via Paypal button below. *to maximize donation cash/cheque payable to PMAST accepted at the door – email info@pmast.org for reservations.